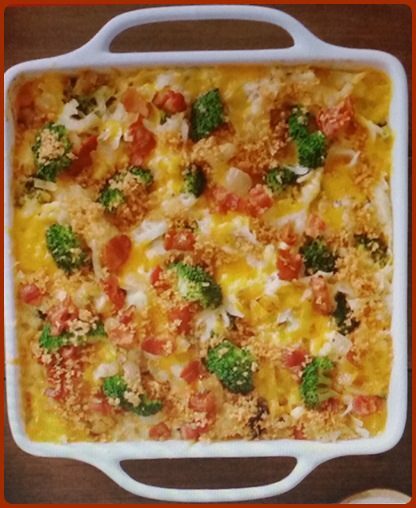 Our recipe for Bacon Hash Brown Casserole is sure to become a favorite side dish, whether you are making it for family dinner or entertaining guests. This hearty side takes just 15 minutes to pull together and then goes into the oven to bake to perfection. This recipe is versatile enough to go from brunch to dinner. And you can feel free to swap in your favorite vegetable for the broccoli. Heat the oven to 350°F. While the oven is heating, cook the bacon and onion in a 10-inch skillet over medium heat until the bacon is crisp, stirring occasionally. Spoon off any fat. Stir the bacon mixture, soup, sour cream, 4 tablespoons butter, potatoes, broccoli, green onion and cheese in a large bowl. Season the mixture, if desired. Stir the panko and remaining butter in a small bowl. Spoon the potato mixture into a lightly greased 9x9x2-inch baking dish. Sprinkle with the panko mixture. Bake for 45 minutes or until the mixture is hot and the panko mixture is golden brown. Re: Bacon Hash Brown Casserole!